The enzyme DHX9 is critical for unraveling the tangle of DNA and RNA strands that allows for the transcription and duplication of information within the cell. This enzyme enhances replication of some but not all RNA and DNA viruses. For Epstein Barr virus (EBV), the virus responsible for mononucleosis, DHX9 prevents the virus from replicating. New research at University of Utah Health identified one protein that shuts down DHX9, allowing EBV to proliferate. The results are available online in the Journal of Virology. To explore why EBV replicates so easily, researchers examined cell lines in which they inhibited the cellular helicase DHX9. Upon knocking down DHX9, EBV replication increased four-fold. Clearly, something was happening around DHX9. They dug further and found the SM protein made by EBV may be the key to this mystery. To characterize the interaction between the SM protein and DHX9, researchers performed immunofluorescence microscopy of EBV-infected cells and showed that the two proteins are linked in the cell. They found that DHX9 activates the cell’s innate antiviral pathways against EBV; however, things change when the SM protein binds to DHX9. The protein counteracts the enzyme’s antiviral function. During lytic cycle, the virus replicates, producing many thousands of copies before the cell ruptures and releases the viral swarm on the host. In the immediate early phase of the lytic replication cycle, SM stimulates transcription of genes essential for the virus to replicate. However, knocking out the SM protein prevents this from happening. 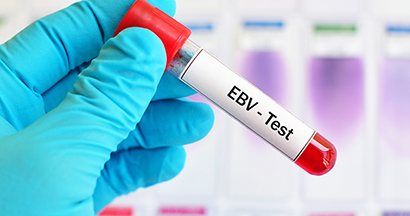 People are commonly infected with EBV and develop mononucleosis in young adulthood. The symptoms include fatigue, fever, inflamed throat, swollen lymph nodes, enlarged spleen, swollen liver, and rash. Most people recover from the illness in a few weeks, but the virus remains inactive in the body for the rest of the person’s life. The latent virus can reactivate if the person’s immune system weakens. EBV is also associated with some types of lymphoma, a cancer of white blood cells. Swaminathan was joined in this project by Wenmin Fu, Dinesh Verma, and Ashlee Burton at U of U health. Their work, titled Cellular RNA Helicase DHX9 Interacts with the Essential Esptein-Barr Virus (EBV) Protein SM and Restricts EBV Lytic Replication, received support from the National Cancer Institute.